A lot has changed in the blogging world during the last few years and trying to find my way back in is quite challenging. Writing this post did take me quite some time. But what a better way to get back than to share a new recipe?!.. Have you tried these small green legumes known as mung beans or green gram? I had eaten these beans in the form of sweet mung bean fritters called ‘gato zamberique’ in Mauritius; but I never tried to cook these before I came across this recipe on The Muffin Myth. Being a beginner in bean cuisine, I was not quite convinced about what the outcome would be. Now it has become one of my favourite recipes and it’s definitely worth sharing for my come-back in the blogging world. This mung bean and coconut soup is not only delicious and comforting, but it’s packed with vitamins and minerals. And I love the fact that mung beans cook quickly without any pre-soaking unlike many other legumes. So they are just perfect for a quick weekday meal! In a large pot, heat the oil over medium heat. Add the cumin seeds and cook for about 1 minute until they just begin to darken. Add the crushed garlic and sauté for 3-4 minutes until browned, taking care not to let them burn. Add the tomatoes (blended with little bit of water) and stir to combine. Then add the ginger, ground coriander, thyme, turmeric, salt and paprika. Cook the mixture for 5 minutes, stirring frequently. Next add the water and mung beans. Bring to a boil, then cover and simmer for about 30 minutes until the mung beans are cooked. I usually use my pressure cooker; so they are done in 15-20 minutes. Taste the mung beans to make sure they are cooked before stirring in the coconut milk. Cook for a couple of minutes more and then turn off the heat. Stir in the chopped cilantro and juice of 1 lemon. Add in more water according to your taste. I usually prefer having it as a soup but it can be served as a curry as well over rice or with naan bread. Left overs can even be frozen for later! 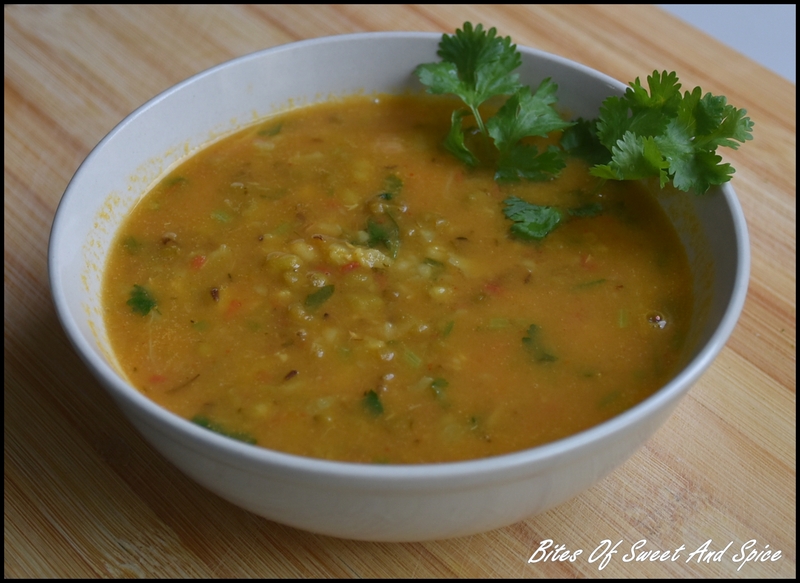 This entry was posted in Beans, Mung beans, Side dishes, Soups and Salads, Vegetarian and tagged Coconut Milk, Comfort Food, Curry, Dhal, From scratch, Garlic, Green Gram, Lemon, Moong Bean, Mung Bean, Recipe, Soup. Bookmark the permalink. mmm. . . This dish sounds wonderful, and I like how it is versatile and can be served either as a soup or over rice or with naan bread. Wanna make sure you don't miss any of my posts? Rasgulla... Or should I call it Indian Gulab Jamun?